A master of public administration degree is often sought by government professionals seeking to advance their careers and new college graduates continuing their education without a break between courses of study. Choosing an MPA school can be a daunting task. Unfortunately, there is no formula you can use. It is most important to find a school that fits you and your goals. Considering the 8 factors below can help. See which ones are most important to you, and use them as a yardstick to measure schools and compare them to one another. As you're perusing MPA school websites, look closely at the curriculum. See if the courses are geared toward the level of government you want to work in. 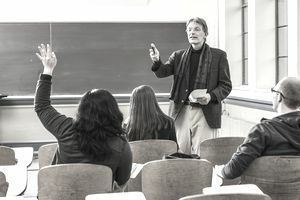 A rule of thumb for the curriculum is if the degree is called a master of public affairs, the school is preparing graduates for foreign policy, national government, and academic careers, and if the degree is called a master of public administration, the school is preparing graduates for careers in state and local government. This won't always be true, but it's pretty close. Look at the faculty biographies, curriculum vitae and publications. Try to find a handful of faculty members who hold similar interests to yours. Later when you arrive on campus, immediately start developing relationships with those faculty members. At least one of them will likely be on your thesis committee. Be pragmatic when it comes to the cost of your degree. Unless you anticipate a need to impress someone with the name of your MPA school, consider the lower cost schools first. A graduate degree is what you make of it, so if you apply yourself, you'll get more than your money's worth. Based on your personal needs and preferences, an optimal location for an MPA school can mean several things. Do you want to be close to family? Close to internship opportunities? Close to your current job? There are enough options that you don't have to reorganize your life around your MPA school. If you are geographically limited, that just helps you narrow down your search for schools. If you are starting work on your MPA right after finishing your undergraduate degree and you have no appreciable experience in the public sector, you need to do an internship or find a government job while you're in school. If a school doesn't have a solid track record of placing students in internships, it's probably not the school for you. Talk to a handful of alumni. They will give you the honest, inside scoop. If the program was worthless, they'll tell you. If it was the thing to take their career to the next level, they'll tell you that as well. Ask plenty of questions. In fact, as too many questions. People love to give advice, particularly about things they know about and are proud of. They'll be flattered you asked them about their MPA experience. Most universities have a career services department. Department staff foster relationships with employers with the goal of getting their school's graduates placed in entry-level jobs. Many people do not take advantage of career services at their school. Visit with someone in the career services department for each of your top few schools. See if they have experience placing graduates in the type of job you want to have waiting for you when you graduate. Each year, U.S. News and World Report ranks colleges and universities on various aspects of what the schools can offer students. Don't overemphasize the rankings in your decision-making process. They're other people's opinions, and you need to go to the school that most suits you.